If you love smoothies, purees, or juices, your blender probably sees a lot of use. But how much cleaning does it see? If your answer is "not enough," you're not alone. Cleaning a blender is a little more involved than scrubbing a saucepan or tossing something in the dishwasher. A good, thorough cleaning is important to maintaining the appliance, and it prevents bacteria growth from food residue that gets stuck in the nooks and crannies at the bottom of the blender jar. To get your blender truly clean, you have to take apart the jar assembly and clean the gasket, blade, and base. Liquids can get down there and dry, cementing the base to the jar and possibly promoting bacterial growth. Take the blender apart. Unplug the blender unit. Remove the jar assembly from the motor base. Remove the jar lid. Unscrew the base of the jar, being careful of the blade. Remove the gasket seal and the blade. Wash the jar. Clean the jar with warm soapy water and a dish rag or sponge. Rinse it thoroughly, then dry it carefully. The jar of the blender can also be washed in the dishwasher on the top rack, although hand-washing is faster and eliminates the risk of etching the glass or plastic. Wash the other small pieces. Hand-wash the gasket seal, cutting blade, and jar base (or locking ring). Use warm soapy water, and take care to watch the sharp edges of the blade. Rinse the parts thoroughly, then dry them. Run the blender for stuck-on items. If your blender has sat for a while without being cleaned, you may have some dried, stuck-on food to contend with. To make it easier on yourself, mix a 1-to-1 ratio of baking soda and water, and run it through the assembled blender. Dump out the solution. Take apart the blender and follow the steps above for washing the components. Clean the motor housing. Always unplug the blender before cleaning the motor base. Never submerge the base in water. It is not safe to put in the dishwasher, either. Wipe down the motor base with a warm, damp cloth. Remember to wipe down the cord periodically and to check it for damage. Reassemble the blender and store it. 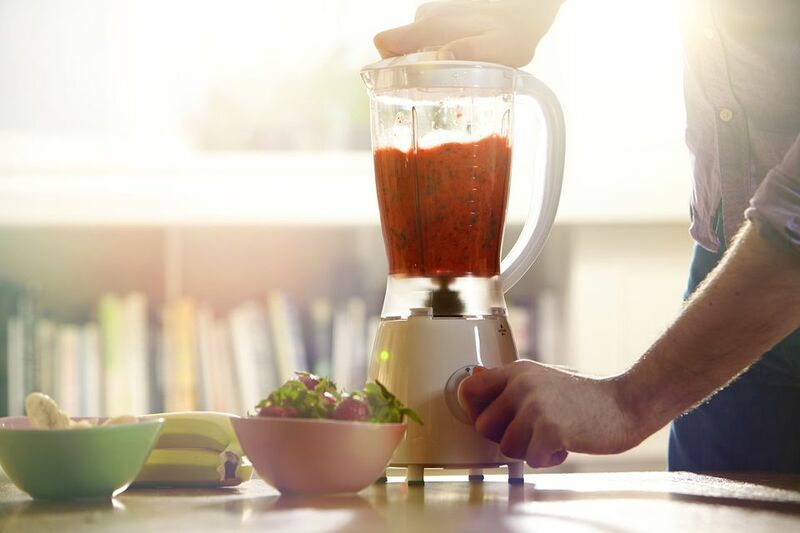 If you use your blender often enough, store it on your countertop or in another easily accessible location. If your blender only makes it out for special occasions, store it in a less accessible place. In addition to the following general tips, check your owners manual for special cleaning recommendations. Many blender lids come apart into two pieces. Check your owners manual to see if yours does. Taking apart both pieces and cleaning them separately will get any stuck-on food in the crevices of the lid. Glass and plastic jar blenders can be etched and scratched by washing in the dishwasher. Hand-washing is a quicker and safer way to keep your blender clean and looking nice. Smelly foods can seem to linger in a blender. Prevent this by not storing items in the blender. If you have a smelly blender, blend a 1-to-1 ratio of baking soda and water together in the blender. Then let the solution sit in the blender for five to 10 minutes before washing normally.